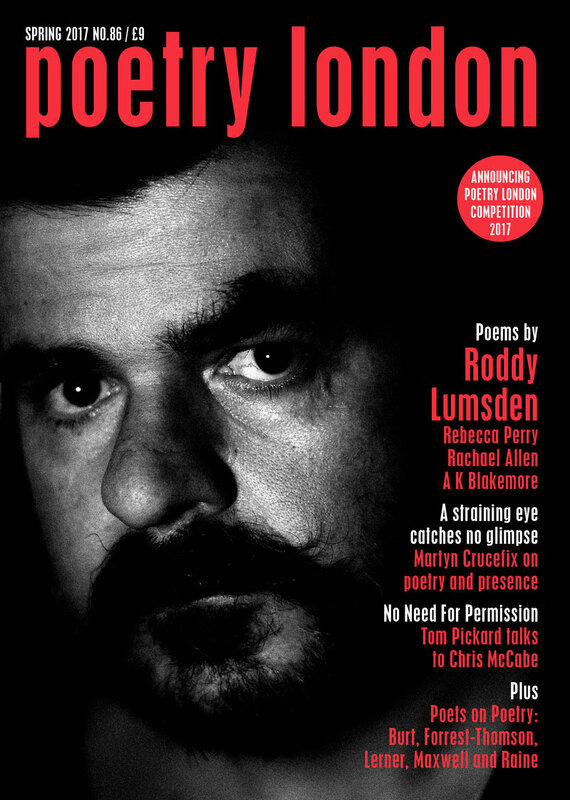 The Spring 2017 issue of Poetry London brings together significant selections of new work from Roddy Lumsden, Rebecca Perry, Sean O’Brien, Rachael Allen and A K Blakemore. There is an emphasis on translation, including the Austrian poet Ann Cotten, Jacques Tornay translated by Annie Freud, and Ye Lijun translated by Fiona Sze-Lorrain. The issue also offers new poems from established names such as Penelope Shuttle and Matthew Sweeney, alongside Hugh Foley, Lucy Mercer and Ian Cartland. In the Reviews and Features section, Martyn Crucefix explores the idea of presence and its opposite in the work of Yves Bonnefoy, Li Po, Shakespeare and Daoist philosophy. Peter Robinson welcomes Don Share’s monumental edition of Basil Bunting’s poems while Chris McCabe interviews Tom Pickard the Newcastle poet who contributed so much to the revival of Bunting’s work fifty years ago. Luke Kennard writes on Anne Carson, Claire Trévien on Sharon Olds and others, and a range of reviewers respond to the work of poets as critics and theorists of the art. This issue also announces Poetry London’s 2017 competition. You can read a selection of poems and features from the issue here. True sentences are no help. Was There an Explosion at the Cherub Factory?